You Can't Run NYC Subways with Bayonets! You Can’t Run the Subways with Bayonets! For a Solid Transit Strike, Mobilize All New York Labor! With the December 15 contract deadline for New York City subway and bus workers looming, the ruling class has switched into high gear whipping up a fear campaign against Transport Workers Union Local 100. On Friday, December 6, multi-billionaire mayor Michael Bloomberg declared that if there is a transit strike “people will die” – supposedly because of traffic congestion blocking ambulances. Two days later, Governor George Pataki’s office leaked that it was preparing to bring in the National Guard to patrol the city in a strike. In their strikebreaking zeal, the capitalist rulers would put NYC under martial law, like after the September 11 World Trade Center attack last year. “Strike Force” screamed the front page of the New York Post (9 December) with a photo of a rifle-toting Guardsman. Now Bloomberg and Pataki are in court to get injunctions banning a strike under New York’s union-busting Taylor Law, as Mayor Rudy Giuliani did in 1999. On Saturday, thousands of TWU members flooded into the Javits Center in Manhattan to overwhelmingly vote to authorize a strike. But the Local 100 leadership under president Roger Toussaint, elected in 2000 as part of a “reform” slate, is using this as a pressure tactic rather than gearing up the membership for all-out battle. It is looking to the Democrats in the City Council, who in turn are calling on Republican governor Pataki to intervene! The battle of New York city transit is not some isolated local dispute, but hits at the heart of international finance capital. Without a steady supply of workers delivered every workday morning, Wall Street can’t function. A solid transit strike would also wreak havoc with Bush’s war on Iraq. You can bet it would quickly be placed on the National Security Council agenda. Already the bosses’ press is squawking about a “communist underground” in the subways and “Toussaint’s jihad.” When they portray transit strikers as “terrorists,” the unions should tell the red-baiters and labor haters to go to hell. U.S. rulers are the ones who terror-bomb Afghanistan and Iraq and seek to terrorize working people, minorities and immigrants here into submission. What’s needed is to defeat the bosses’ war through sharp class struggle. The TWU ranks must prepare for a hard battle, and they must be backed by the combined strength of the organized workers movement in New York. 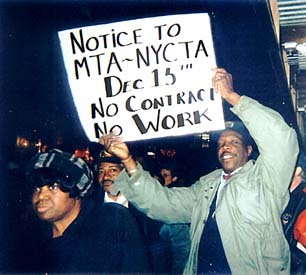 NYC transit workers should join in struggle with United Air Lines workers, whose union gains are threatened by court action, and West Coast dock workers who were sent back to work under the slave-labor Taft-Hartley law. Against threats by city and state governments to use strikebreaking laws, transit workers should defiantly reply: You can’t run the subways with bayonets! We say: Burn their injunctions and turn the scab law into a dead letter. If any transit workers or TWU leaders are arrested or fines imposed on the union, all city labor should walk out and shred the Taylor Law! The Metropolitan Transit Authority’s insulting contract offer amounts to a pay cut (no wage increases for two years, plus taking more from workers’ paychecks for health and pension funds). The TWU should declare “no contract, no work, no extensions – strike now!” Make the scheduled December 16 labor march across Brooklyn Bridge to City Hall into a mass mobilization of tens of thousands of unionists and their supporters on the first day of a strike. Other unions should join in active solidarity with the transit workers and tie the city’s elaborate “contingency plans” in knots. The TWU is fighting for all of city labor: AFSCME is next up on the mayor’s hit list. We say: Shut down New York and keep it shut until Bloomberg, Pataki and the financiers fork it over! The MTA bosses are guilty of homicide. The Transit Authority’s refusal to follow the most minimal safety rules, in force on all other railroads in the area, has led to repeated deaths of transit workers. Two track workers – Joy Antony and Kurien Baby – were killed in two days last month because the MTA forced them to work without flagmen to warn approaching trains. Local 100 should have struck the system then and there. TWU militants should demand the formation of union safety committees authorized to shut down traffic at any dangerous spot. The MTA is trying to loot the pensions and sock transit workers with rising health care costs. The TWU should make a non-negotiable demand that there be full health care for all transit workers – no “co-pays,” zero deductibles – and campaign for free, quality medical care for everyone. Transit workers complain of the Transit Authority’s vicious “plantation justice” system of imposing sanctions on its employees in order to “keep them in line.” Since the last contract, management has written up as many disciplinary notices as it has workers. The union should demand that all disciplines be wiped out. The TWU should champion minority and immigrants’ rights. The overwhelmingly black and Latino WEP (“workfare”) workers should immediately be made union members at full union-scale wages. The union should demand full citizenship rights for all immigrants. Meanwhile, all police (such as the revenue cops) should be thrown out of the TWU and the unions: police are the armed fist of the class enemy, who we face on the other side of the strike barricades. New York City rulers are trying to set the population against the transit workers union, even as they plan a whopping fare hike to $2 a ride. The TWU could win huge popular support by aggressively demanding free public transit. We say: rip out the turnstiles, train the clerks to run more trains to reduce overcrowding, and build the Second Avenue subway. The MTA, the mayor and the governor will plead poverty – pretty ludicrous coming from this gang of millionaires and billionaires. The entire city deficit could be paid off from Bloomberg’s piggy bank. The MTA talks about “rising costs,” but what costs are rising – it sure isn’t transit workers’ wages! The costs they’re talking about are overwhelmingly debt service to the bankers, some $2.3 billion a year. Some of these “loans” go back to the 1930s when the city took over the privately owned subways, and they have been paid for many times over. The TWU should demand: repudiate the debt! Clearly, such a revolutionary program is not going to be won by business-as-usual business unionism, even dressed up in “reform” garb. 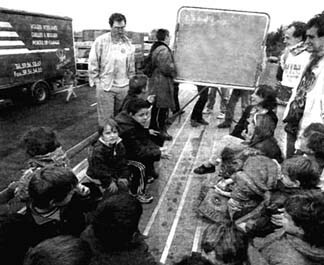 A fighting leadership of the unions must be forged, one that breaks with the Democratic and Republican parties of capital (and second-string capitalist outfits like the Greens and the Working Families Party) and undertakes to build a class-struggle workers party that fights for a workers government. We make the city work, and we can make it stop! The transit workers’ fight is the fight of all New York City workers, minorities, immigrants and poor – that is, of the overwhelming majority of the population against the tiny minority of the filthy rich who think they are masters of the universe and can trample on everyone else. A leadership that has the program and determination to stand up to this bunch of capitalist thugs could win wide public support. We have the power – use it! WITH A NYC TRANSIT STRIKE! NYC United Federation of Teachers Delegates Assembly on December 4 . THAT in the event that transit workers, school workers and/or union officials are jailed under the Taylor Law or other anti-labor injunction or decree, that the UFT itself strike against such scab laws demanding that all unionists be released and charges against them dropped.